We talked quite a bit about the Pittsburgh Courier a few weeks ago, in regard to their color comics section. Here's an earlier Courier strip which actually died as a casualty to the creation of that section. Bucky first ran on July 31 1937, credited pseudonymously to 'Bobby Thomas'. Samuel Milai, the actual creator of the strip, was doing so much work for the Courier that he would occasionally sign his material with other names. This was probably at the behest of the paper. It's my guess that the Courier wanted to appear to have more cartoonists working for it than it actually did. The pseudonym didn't last for long on Bucky, though, and Milai took credit for most of the run. Bucky wasn't particularly memorable, being yet another precocious kid strip, but Milai's artwork was of better quality than the typical fare found in the black papers. The strip ran until August 12 1950, ending the week before the inauguration of the new color comics section. Thirteen years is a marathon run for any feature in the 'race press', where strips came and went quickly, often because the artists failed to get paid for their work. Milai wasn't out of work, though - he started the Don Powers strip for the color comics section. Bucky was resurrected for a short while in Milai's John Henry and his Friend Bucky which ran in the Courier in 1960-61. 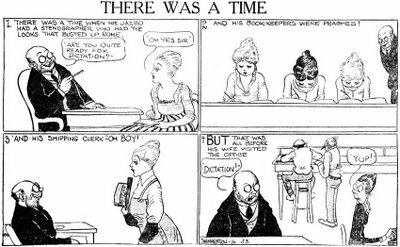 A week or two ago we talked about Jimmy Swinnerton's Mister Jack strips that were not printed in the New York Hearst papers. Here's another series that, if it appeared there at all, was run rarely enough that Jeffrey Lindenblatt, who indexed the Hearst New York papers, didn't note it as a series. 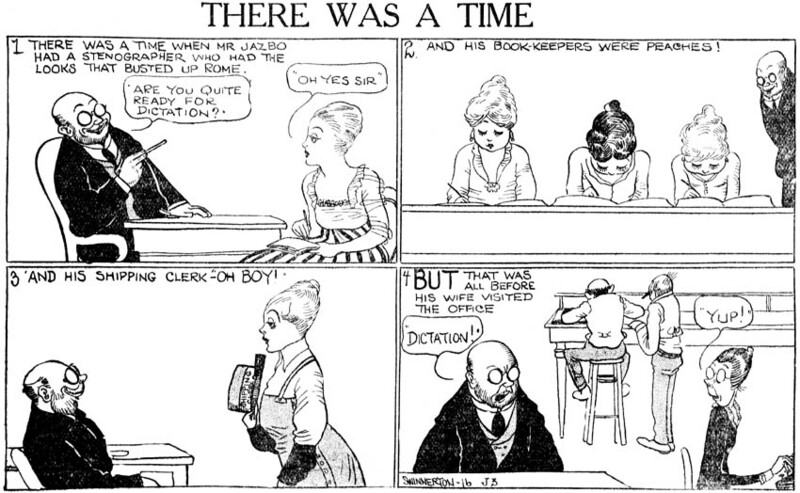 However, this strip ran pretty regularly in 1917 on the Pittsburgh Post's daily page of Hearst strips. Anyone have more information? Update June 2009: Turns out this was sort of a companion strip to An Embarrassing Moment. It apparently started sometime around August 1916, then by Fred Locher. Swinnerton took it over at the same time he took over the other strip, in October 1916. Here's a real obscure item called Life's Little Phonies. It ran in 1915 from an unknown syndicate (but my spidey sense tells me that it may be Wheeler Syndicate). The cartoonist, if I decipher the scrawl correctly, is Bowers. There was a Joe Bowers who did Dizzy Dramas, don't know if this is the same fellow. What I find interesting about this little panel cartoon series is that the joke, and there really is only one, is based on the novelty of the telephone. 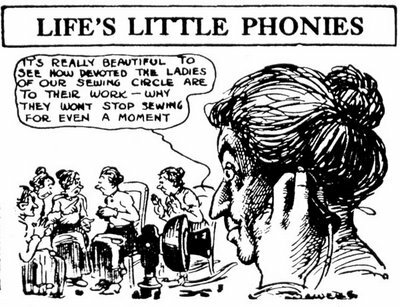 New users of this wonder quickly realized that the telephone gave them a measure of anonymity in their conversations, and these cartoons are all about phone users taking advantage of that situation to lie. Update1: Jeffrey Lindenblatt tells me that Deathless Deer, discussed two posts ago, did indeed run a little longer outside the NY Daily News. Long Island Newsday, presided over by Alicia Patterson, who was also the writer of the strip, ran the feature until August 7 1943, several weeks more than the News. But that brings up the question that if the strip was available through August 21st, why would the paper owned by the strip's writer not run it to the bitter end? Jeffrey and I thought perhaps that E&P just got the end date wrong, but on the other hand, we know that strips are normally produced a minimum of six weeks ahead of their running dates. Since the News cancelled the strip abruptly, why would there have only been another three weeks of material available? It makes far more sense for the end date to be August 21. So the question still stands - can someone find Deathless Deer running to the supposed end? And if that end is really on August 21, why did Newsday drop it early? Curious, very curious. Update 2: Todd Hillmer takes up the slack from my sloppy notes by sending me a sample of How Do They Do It? from 1917. So it definitely started that early. Thanks Todd! There's also Charles Bowers, who in about 1915 or so began working on the animated version of the main Wheeler strio, MUTT & JEFF. I've seen samples of Bowers' drawing style and this could be him. Well, your ID meshes perfectly with my assumption about the syndicate. Sounds like kismet! I. Klein said some things about Charley Bowers in his col in CARTOONIST PROFILES - and for those really interested, Bowers has some of his live action film out on CD-- you can also find out more about his animation work in BEFORE MICKEY, and others. Comic strip, animation, live action comedy; he got around. 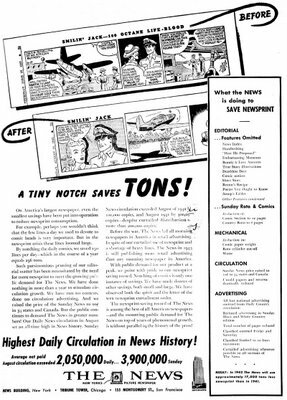 "following the action of the new york daily news june 20 announcing the discontinuation of the...strip to reduce newsprint consumption the chicago tribune - ny daily news syndicate ...is suspending the strip on the decision of the author and artist." "The syndicate informed its newspapers that the last mailing had gone out with strips dated through Aug 21. Newspapers were free to continue it until then or suspend at any time." If you want to buy the scrapbook let me know. don- please contact me about deathless deer, if you read this. I have some original materials also. Here's a few more interesting items from the 1943 Editor & Publisher bound volume. Bell Syndicate has re-signed Frank V. Martinek to a long-term contract, it has been announced. Martinek is creator of "Don Winslow of the Navy," daily strip. Cartooning is an avocation with Martinek, who is assistant vice-president of the Standard Oil Company of Indiana. 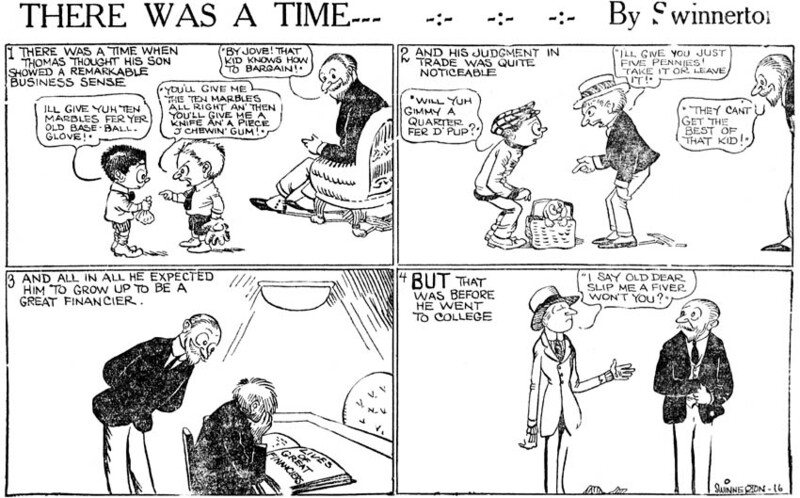 Continuity in Harold Gray's "Little Orphan Annie" comic strip, distributed by the Chicago Tribune-New York News Syndicate, portraying a mythical OPA official handling gasoline rationing in a typica1 American community in dictatorial fashion, was criticized and defended last week by papers using the strip.
" 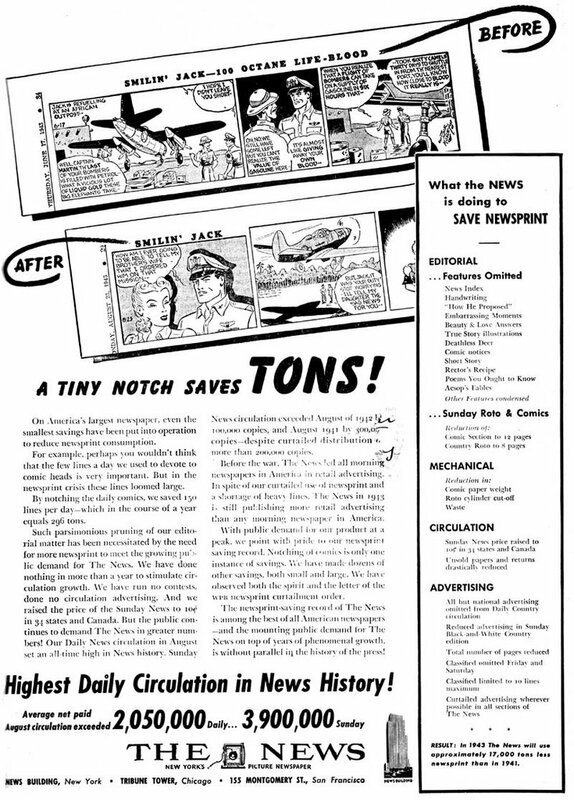 'Little Orphan Annie* was dropped because its sponsors, a syndicate controlled by the New York Daily News and the Chicago Tribune, had turned it into a vehicle of propaganda against gasoline rationing. The Courier-Journal, as readers of this letter column, of our columnists and of our reports of controversial news and speeches know, does not mind presenting opinions contrary to our own. "Nevertheless, we have to insist that opinion of whatever kind be duly labeled as such and not smuggled into comic strips in the guise of entertainment." On the other hand, the Waterbury (Conn.) Republican-American editorially pointed out that "the OPA is reported to be squirming" because of the strip's continuity, and that "it would have Gray cease and desist." The OPA does not like the down-to-earth presentation of facts, the Republican-American pointed out, adding, it is another instance of a government agency attempting to censor the press. At the syndicate office Editor & Publisher was told that the "OPA has not communicated with us," and a spokesman denied reports that cartoonist Gray had entered into the controversial continuity at the instance (sic) of either Captain Joseph M. Patterson, publisher of the New York Daily News, or Colonel Robert R. McCormick, publisher of the Chicago Tribune. "It was Gray's own idea," the spokesman said. "In fact, when we first saw the continuity we were under the impression that it would run only a few days. So we let it go through. When we saw that it was running longer than expected and that the theme was strongly on the propaganda side, we informed our clients that we were cancelling the rest of the strips and substituting new ones for them." This was done before any protest had been made by any one, it was said. Since the incident has received publicity, several other papers havewritten to the syndicate, criticizing in one way or another Gray's continuity. "The whole thing is a tempest in a teapot," Mr. Gray informed Editor & Publisher. He was at a loss to understand why anyone would find fault with what he had done. "I took anything I have used out of the daily newspapers," he remarked. "I made nothing up out of my head. 1 can't for the life of me see how any citizen can live in a community and not be affected by the OPA, especially as regards gasoline rationing. "The OPA's state of obfuscation laid them open to a little kidding, which is all I did. Which is all I intended to do. However, the syndicate has asked me to drop the continuity and I have complied. I rather suspect the cartoons struck home in what they were showing or they would have been ignored." The Fairfield (Conn.) News, a weekly, last week published a story pointing out that the name "Flask," which Mr. Gray gave to the strip's dictatorial OPA official, was strangely similar to a Robert C. Flack, chairman of the local ration board. "Is Orphan Annie Hitting Below Belt by Coincidence?" it asked in a headline. In answer to this Mr. Gray explained: "We have a standing rule in the business which calls for us to use inanimate objects as subjects for our names. The name 'Flask' came to me as I was thinking of snoopers. Snoopers brought to mind prohibition. And the next logical thought was the hip flask. That's how I arrived at that name. I'm sory if it has inconvenienced the OPA gentleman. I assure you it was pure coincidence." I just purchased a bound volume of Editor & Publisher for July-September 1943. I've been through much of the run of E&P on microfilm, but most of the work was done at breakneck speed so a lot of interesting material was missed on my first go-round. With the luxury of reading the printed issues at my leisure, I've encountered some interesting little bits and pieces. Today a few questions about articles I found, plus an ad page guaranteed to depress the comics fan. * according to the July 10th issue, the second run of The Bungle Family was syndicated by the Artists And Writers Syndicate of St. Louis. I've known about the second run for years, but had assumed that it was from McNaught Syndicate, as was the original series. Has anyone seen samples from the second series with this syndicate credited? Has anyone even heard of this syndicate? * According to the July 24 issue, the infamous Deathless Deer comic strip was dropped by the NY Daily News in an effort to save precious newsprint, and the loss of the flagship paper prompted the strip's creators to abandon the feature altogether. All this is well-documented. What piqued my interest is a statement that papers were welcome to run Deathless Deer until their supply runs out on August 21. Previously I assumed that the strip ended when the Daily News dropped it on 7/19/43. Apparently there was another whole month available. Question is, did anyone run it? Have you seen the strip run to its 'true' end date somewhere? In 1915 the U.S. was already flirting with the idea of getting involved in what was shaping up to be World War I, aka The War To End All Wars (yeah, right). What could be more appropriate in those troubled times than an anti-war comic strip. Old Nicodemus Nimble was a fabulist inventor who, with the aid of his magical cigar and suitcase full of tricks, spent his time at the European front. In each strip he would bring his powers to bear on the conflict, putting an end to a battle or saving civilians. The strip's anti-war message was clear and forthright, no namby-pamby dancing around the issue. Two years later the strip may well have been considered seditious. Cartoonist W.L. Wells first made the national scene in the Chicago Tribune, where he took over Old Opie Dilldock's Stories from F.M. Howarth. He was an ideal replacement - his natural style was a pretty close match for Howarth's. Wells brought more than a similarity in style to the table, though. He was a master designer whose color Sunday pages have the same 'wow' factor that we get from a McCay, a Feininger or a Dart. Even here, working smaller and in black and white, you can plainly see that each strip treats its space as a coherent whole, with layouts that shout to be noticed. And these samples aren't by any means Wells at his best - sadly my run of this strip is in pretty bad shape and I had to pick samples with an eye toward reproduction. Even so I found it necessary to recreate the text dialogue in sample three since the original was printed so badly. Old Nicodemus Nimble was syndicated by NEA and started on June 24, 1915. It ran daily until October 29 of that year. In addition to the strip, Old Nic' also showed up in a rather incrongruous setting as the host of a panel cartoon titled Golf Hints By Nicodemus Nimble. I'm just looking at these, today, as we've recently put up the Jonah Jimsenweed and Opie Dilldock strips that Wells started out on. This is a neat strip, though I still can't get out of the "uncanny valley" that seeing Howarth's faces drawn by another pen provokes. But an antiwar fellow who smokes a "magic cigar" and stops wars by deploying "laughing gas"? This guy was about fifty years before his time! Great comics with a message. Thank you. This is a neat article! He's actually my great-great grandfather. I grew up looking at a large painting he did that my grandma always had hanging over her couch, (and still does). We didn't know he did comic strips too until recently. I must assume that Tom Dibble, Jr. was either a relative or a pseudonym of Bernard Dibble. 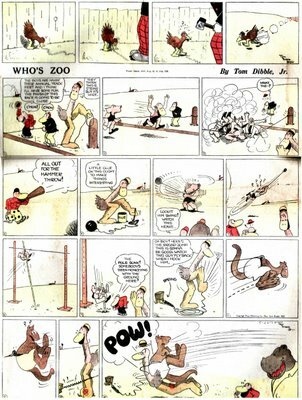 Tom produced Who's Zoo, a Sunday and daily comic strip for the New York World from October 19, 1925 through May 28, 1927 (the Sunday was added September 12, 1926). The strip was in theory syndicated, but I've never seen it outside the home paper, and even there the Sunday was obviously low man on the totem pole, strictly filler. Bernard Dibble was not officially with the World at the time. He was producing Danny Dingle for King Features. However, I hear from various sources that he was also doing a lot of assisting or ghosting for Dirks on The Captain and the Kids, the New York World/Press Publishing flagship strip. Of course, Dibble pretty much took the strip over in the thirties. Could Bernard have been moonlighting here under then name Tom? Surely some expert has the straight skinny? Sorry for the scan quality on this one. The paper was in pretty sad shape, but beggars can't be choosers. This is the only Sunday Who's Zoo I've got in my collection. Bill Blackbeard on the Comic Strip Classics group has referred to Tom as Bernard's father (message #3625) and also as Bernard's brother (#5053). I'm partial to them being brothers. newspaper, has to be seen to be believed for its outre awfulness" (CSC message #5053). So thanks Allan for letting us see the strip. Pretty strong words there from Bill B. on the strip's awfulness! I must say that the ostrich character is one of the most bizarre looking creatures ever. The strip almost has an underground comix feel to it, as if the cartoonist was on a bad trip, and these are the odd creatures he saw dancing in his eyeballs.